This is not the game you’re looking for. Yes, it’s a massive shame. We’ve been salivating over The Force Unleashed for two years, as have most of you, but the end product just doesn’t live up tothe massive expectations it built up. Well, as a game anyway. LucasArts has billed The Force Unleashed as the link between the rather bloated Episode III, Revenge of the Sith, and the excellent original film, Episode IV, A New Hope. As a story, this game hits the spot. In fact, we’d go as far as to say that this is one of the best pieces of storytelling you’ll find on current-gen. No wonder George Lucas gave it his official thumbs up. It doesn’t try to cram in anachronistic cameos, or shoehorn in clever little nods to the original films to try and make itself cool: it just weaves a magical story that’ll keep driving you to the end, no matter how irritated you might get with some of the game’s clumsy flaws. The beautiful visuals certainly help The Force Unleashed to get its plot and emotions across with maximum impact. Pre-rendered cut-scenes are incredible – perhaps the best you’ve seen this gen – as each of the characters looks genuinely alive, and the in-game business doesn’t look too shabby either. Coupled with that, the beautiful Star Wars score echoes throughout every moment, giving the experience that stirring, authentic feel. The fact that the game is so perfectly pitched and presented toward Star Wars aficionados is its greatest asset, but for you, it’ll be the biggest problem. You see, as a game The Force Unleashed is not money well spent. It’s a fairly standard, fairly short action game with too few frills and too many problems. Oh, and no multiplayer whatsoever. Clocking in at around six to eight hours, depending on how talented you are with a lightsaber, or how willing you are to wander each level looking for every bonus item, this isn’t great value for money. Once the story is finished, you’re unlikely to go back for another play-through. 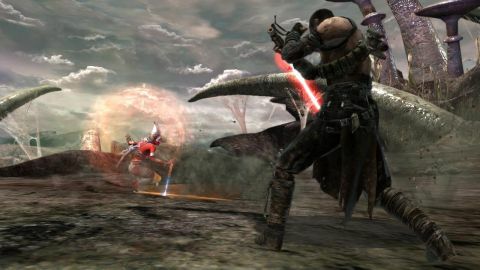 The problem is that games like Devil May Cry 4 and Ninja Gaiden 2 have come along in 2008 and rather embarrassed The Force Unleashed. While they offered slick combat that switched effortlessly between close and ranged combat, this game feels clunky and unrefined by comparison. The opening level of the game, where you play as Vader, is particularly slow and tedious. Picking up Wookiees and lobbing them into the abyss may seem like a laugh, but after around 50 or 60 times performing the same move, it can get a bit tedious. It’s a relief, then, to take control of the Secret Apprentice in the second stage. He feels quicker, more responsive and has a better range of moves and combos (which can be expanded and upgraded as you collect cubes or level up). However, the action still feels linear and repetitive. You’ll quickly realize that each of the game’s fancy-pants locations are nothing more than corridors with attractive furniture (you know, to make them seem less like boring, old corridors). Boss fights, too, have a certain air of predictability to them and most can be beaten using the same combo over and over. Breaking up the familiar, however, is the game’s advanced physics engine. There are plenty of objects to pick up and fling around, and the game’s subtle but effective auto-targeting system means you’ll usually hit what you’re aiming at. Things smash and break up in a realistic way, and yes, bodies flail about and distort when you lob them into walls. Sadly, the corpses disappear once they’re dead, which sends you back down to earth with a bump from any kind of reverie you might have built up by lobbing things around. Description The Star Wars saga takes a dark turn in this third-person actioner, which takes place between the trilogies and casts you as Darth Vader's secret apprentice - a brutally powerful force user charged with hunting and killing Jedi.